The University will soon ask all students to participate in a climate survey on sexual assault and misconduct, in partnership with the Association of American Universities (AAU). Universities use climate surveys to understand their students’ experiences with sexual violence, harassment, relationship violence, and other sexual misconduct in order to align resources and prevention efforts with the areas of greatest need. 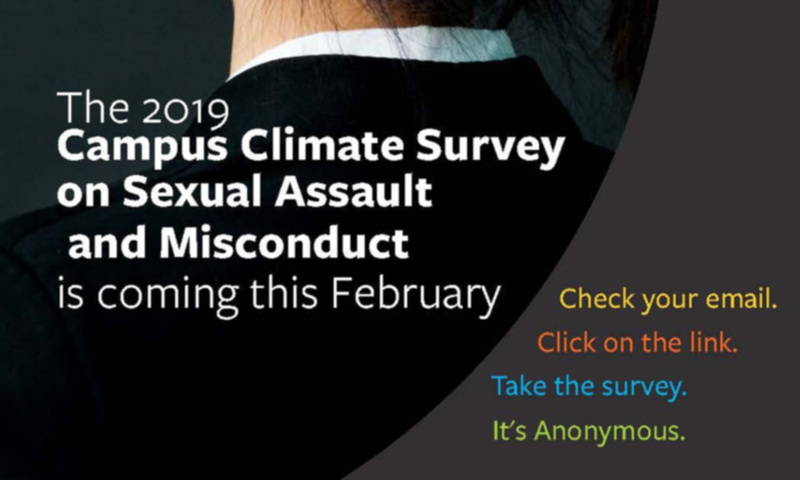 All University of Rochester students—undergraduate or graduate students in any school or college—are encouraged to take the AAU Campus Climate Survey on Sexual Assault and Misconduct. The survey link will be in your University email starting Monday, Feb. 4. It should take about 20 minutes to complete. Some students will receive a $5 Amazon gift card online after completing the survey (gift card recipients are randomly selected by the survey administrators). It’s anonymous. The data will be analyzed by the research firm Westat, and then AAU will release aggregate results from participating universities and provide each institution with its own data set to decide how to share. The University’s results will be communicated broadly in fall 2019. The survey ends on March 5. Achieving a good participation rate for this survey is really important to the University in order to fully understand the areas that need more resources or attention. Read more about the survey. Additionally, beginning Feb. 11, students who present a photo/screenshot of the completed survey page, or who complete the survey at one of the tabling sessions below can receive $5 in cash (while supplies last at each event). Monday, Feb. 11: Goergen Hall Atrium, 11 a.m.–3 p.m.; and Wilson Commons Hirst Lounge, 4–6 p.m.
Tuesday, Feb. 12: Flaum Atrium, School of Medicine & Dentistry, 10 a.m.–1 p.m.; Helen Wood Hall 1W-300, School of Nursing, 2–4 p.m.; and LeChase Hall 1st floor, Warner School of Education, 4:30–7:30 p.m.
Wednesday, Feb. 13: Dewey Hall 1-211C, AS&E, 1–4 p.m.; and Goergen Athletic Center, 5–7 p.m.
Thursday, Feb. 14: Eastman Student Living Center, 10 a.m.–2 p.m.; and Schlegel Hall Office of Student Engagement Vestibule, Simon Business School, 4–6 p.m.
Friday, Feb. 15: Wilson Commons Hirst Lounge, 11 a.m.–5 p.m.
Monday, Feb. 18: Wegmans Hall, 11 a.m.–2 p.m.
Tuesday, Feb. 19: Flaum Atrium, School of Medicine & Dentistry, noon – 3 p.m.; and Helen Wood Hall 1W-300, School of Nursing, 3:30 – 6:30 p.m.
Wednesday, Feb. 20: Dewey Hall 1-211C, AS&E, 1–4 p.m.
Thursday, Feb. 21: Lowry Hall, Eastman School of Music, noon–4 p.m.
Friday, Feb. 22: Goergen Hall Atrium, noon–3 p.m.; and Wilson Commons Hirst Lounge, 5–7 p.m.
Monday, Feb. 25: Wegmans Hall, 11 a.m.–2 p.m.; and LeChase Hall 1st floor, Warner School of Education, 4:30 – 7:30 p.m.
Tuesday, Feb. 26: Schlegel Hall Office of Student Engagement Vestibule, Simon Business School, noon–2 p.m.; and Flaum Atrium, School of Medicine & Dentistry, 3–5 p.m.
Wednesday, Feb. 27: Dewey Hall 1-211C, AS&E, 1–4 p.m.; and Goergen Athletic Center, 5–7 p.m.
Thursday, Feb. 28: Eastman Student Living Center, 4–7 p.m.
Friday, March 1: Wilson Commons Hirst Lounge, 11 a.m.–5 p.m. Anyone in need of support or information regarding reporting sexual assault should see: https://www.rochester.edu/sexualmisconduct.